Ms. Barbara Ward was appointed as the Director for the Center for Minority Veterans in August 2012. 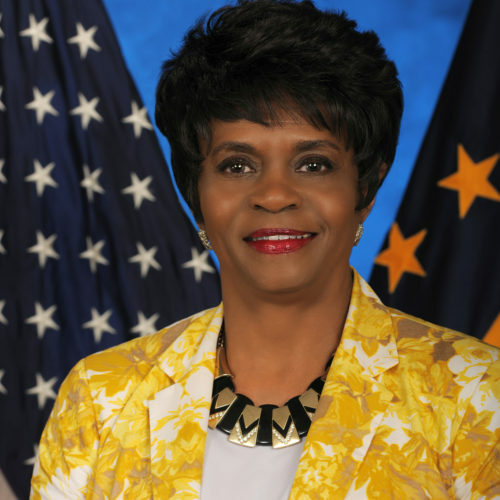 Prior to this appointment, the Governor of California appointed Ms. Ward to the position of Deputy Secretary of Women and Minority Veterans from 2007 through 2011 and as the Bureau Chief of Private Postsecondary and Vocational Education from 2005 through 2007. Ms. Ward also served as a member of the Women Veterans Advisory Committee for three years, and was co-chair of the health sub-committee. As a native of Florida, she attended the Florida Agricultural and Mechanical University, School of Nursing where she obtained her Bachelor of Science Degree. In 1986, she obtained her Master’s Degree in Public Administration, Health Services Management from Golden Gate University, San Francisco. She is a registered nurse with a diverse background in healthcare administration and state government. Ms.Ward has held several executive level management positions including Regional Director of Field Case Management with Kemper Insurance Company; Vice President of Medical Services with Combined Benefits Insurance Company; Assistant Director of Professional Services with the University of California Davis Medical Center and Quality Assurance Coordinator at Mather Air Force Base Hospital. Ms. Ward is a Viet Nam Era Veteran who served in the United States Air Force Nurse Corp at Scott Air Force Base, Illinois. She is a board member and Vice President of the Health Education Council in Sacramento, California and a member of the Alpha Kappa Alpha Sorority Incorporated. As a long term educator, she has been an adjunct faculty member at several universities, including Golden Gate University. Ms. Ward was recognized as the Business Woman of the Year by the Iota Phi Lambda Sorority in 2010, and has received special recognition and awards from AMVETS and American Legion for her service to Veterans. She is the former Second Vice President of the National Association of State Women Veteran Coordinators.